Two of the deaths have been confirmed as suicides, and the other 16 are being investigated as suspected suicides, the Army said. The report follows a spike in January, when 24 soldier suicides or suspected suicides were reported. Twelve of those have now been confirmed and the other 12 are still being investigated, the Army said. Suicide data normally is released annually, but the large increase in January led the Army to start putting the numbers out on a monthly basis. In 2008 the Army recorded 143 suicides, or 20.2 per 100.000 soldiers, the highest number since the service began keeping data in 1980. At that rate, the number of soldier suicides exceeds figures for the general population, which stood at 19.5 per 100,000 people in 2005, a figure considered the most recent, Army officials said in December. The alarming figures have sparked service-wide training programs to help identify soldiers at risk of suicide. The program, which runs February 15 through March 15, will include training to recognize behaviors that may lead to suicide and instruction on how to intervene. The Army will follow the training with another teaching program, from March 15 to June 15, focused on suicide prevention at all unit levels. In addition to the training, the Army has a program called Battlemind, intended to prepare soldiers and their families to cope with the stresses of war before, during and after deployment. It also is intended to help detect mental-health issues before and after deployments. The Army and the National Institute of Mental Health signed an agreement in October to conduct research to identify factors affecting the mental and behavioral health of soldiers and to share strategies to lower the suicide rate. 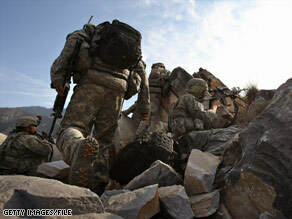 The five-year study will examine active-duty, National Guard and reserve soldiers and their families.